Avishkar Hyperloop to represent India at Hyperloop Pod Competition on July 21, 2019. A student team from IIT-Madras will participate in the finals of Elon Musk’s International Hyperloop Pod Competition in July; it has ambitious plans to build the first self-propelled hyperloop in India. The Avishkar Hyperloop team from IIT-Madras wants to be on top of the hyperloop game. Chennai, Metro Rail News: Avishkar Hyperloop is the student team of IIT Madras, doing indigenous design and development for building the First ever Self Propelled, Completely Autonomous Hyperloop Pod of India and also spearheading country’s attempt at SpaceX Hyperloop Pod competition 2019 with a goal to develop the fastest hyperloop pod ever built and win the competition. The team works with a vision to develop technologies for Future Mode of high speed transportation with its applications in various prominent fields including Defence, Logistics and Aerospace Industry. The team has built a prototype hyperloop pod that would take just 25 minutes to travel from Chennai to Bengaluru, is the only team from Asia to qualify for the International Hyperloop Pod Competition organised by Elon Musk’s Space X. Almost 1,600 teams participated in the first round of the contest. Several rounds later, only 22 teams – 21 of them from the US and Europe – were shortlisted for the final. Last year, the Avishkar Hyperloop team qualified only for the preliminary design round as one of the 47 teams of the total 1,500 competing teams. Hyperloop involves a sealed tube or system of tubes that allows a pod to travel without air resistance or friction, transporting people or freight objects at high speeds. Avishkar Hyperloop, founded and headed by Suyash Singh, claims their pod is likely to achieve 400 to 450 kmph during the finals to be held in July 2019. Elon Musk’s SpaceX runs the Hyperloop Pod Competition to design and build high-speed hyperloop pods. Open to student and non-student teams from across the world, it aims to test a subscale prototype transport vehicle. Teams that qualify for the final round will compete in the company’s hyperloop tunnel (one mile long and with an outer diameter of six feet), purpose-built for the competition at its Hawthorne, California, headquarters. The pod that clocks the highest speed will be declared the winner. SpaceX had announced the competition in 2015; three editions have been run so far – in January and August 2017 and July 2018. WARR Hyperloop, from the Technical University of Munich, won the competition in August 2017, clocking 323 km per hour, and again in July 2018 with a speed of 467 km per hour. However, the design proved to be challenging for the team. “We are going with electric propulsion using DC motors,” Ankit says. “We are targeting speeds higher than 400 km this year within a distance of 1 km,” he explains. The team’s founder, Suyash Singh, was inspired by Elon Musk and that sparked the idea of hyperloop technology for India in him. Ankit Kukudia and Vinit Sharma joined Suyash’s efforts. The team has now grown to a 30-people strong team, with members ranging from freshman graduates to PhD scholars. All team heads are post-graduates. 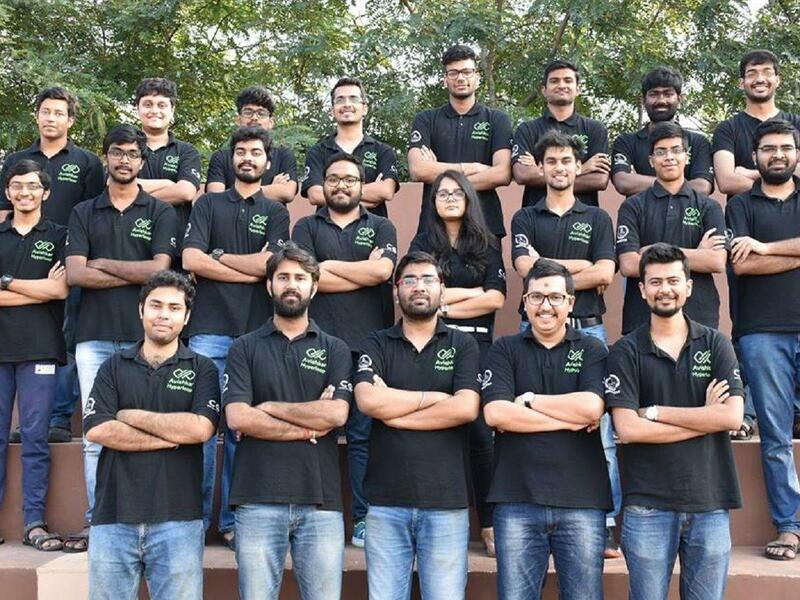 Ankit says, “Our team was basically made to lay the foundation for an indigenously developed hyperloop system for India.” Some members, including Suyash, Ankit, Vinit, Avinash Kumar, Denil Chawda, Nitin Srikar, Rakshit Bhatt, Kalpesh Pawar, and Anshul Singh, have been a part of the team from inception. The team is mentored by Professor Satya Chakravarthy, NCCRD Co-ordinator, IIT-Madras; Ravi Santhanam, an IIT-Madras alumnus; and Professor Boby George, CFI Advisor, IIT-Madras. Team Avishkar aims to develop India’s first self-propelled autonomous hyperloop pod and has been raising money through crowdsourcing on Ketto. Ankit says the team has “a larger vision” for the project. “Laying the foundation for an indigenously developed hyperloop system for India will take a few years; only after that, will it be tested on the tracks. We believe the team has a long way to go and we expect the student team to be involved till the hyperloop competition is held,” he says. Speaking about where the project is headed, Ankit explains that the current intent is to work for two years and clock the highest speed possible. The team is also simultaneously working to incorporate a magnetic levitation in the pod and is making efforts to perfect that technology. Once a good speed is achieved, the team will work on optimising the payload and adjusting to the operating conditions before the pod can be tested on the live track, which is being built as well. “This may take five or more years,” Ankit says. The team plans to convert this project into a startup once it reaches the stage of commercialisation. “Of course, it won’t be easy from the competition point of view since SpaceX wants us to improve on our previous design. But we are more than determined to not let our achievements end with this. We want to step up our game, keep developing, and winning the competition over the years,” Ankit says. Previous articleNew Metro Rail Line of 200 km planned for Hyderabad: K.T.R.